Water is the cleanest and purest element from the nature. The concept of this project is to reflect the clearness of pure water and use Eco-friendly methanol energy as the main power. Today’s digital devices; notebooks, cell phones, and PDAs are getting smaller and more powerful than ever, but a roadblock obstructs further miniaturization: the duration of batteries. 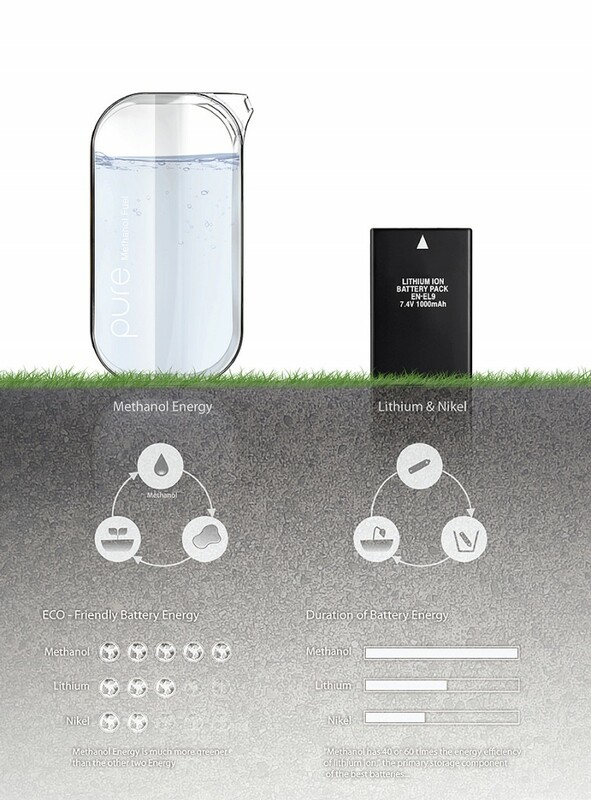 To improve the duration of the battery and make it more eco-friendlier this “Pure Phone” uses Methanol energy. A. ‘Methanol has 40 or 60 times the energy efficiency of lithium ion’ the primary storage component of the best batteries, estimates Dr. Brian Barnett, managing director of the TIAX LLC consulting firm. C. Less expensive than the fuel price. Based on the image of clearness and pureness of water, the mobile phone’s shape, material and color were defined. The mobile phone’s overall shape was inspired from a streak of water drop. 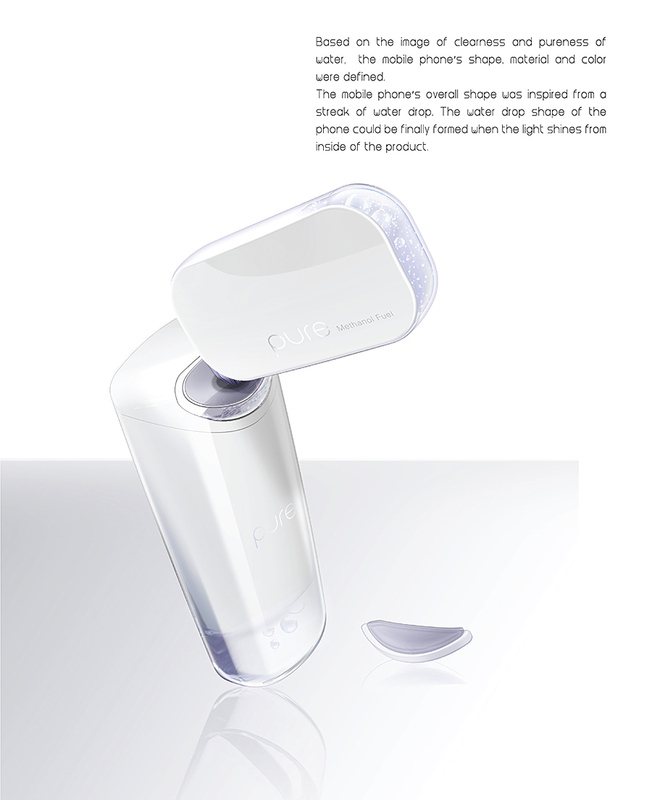 The water drop shape of the phone could be finally formed when the light shines from inside of the product. A. Problem: Often, touch screen mobile phone users face difficulty of pushing the right numeric or alphabetical buttons on the flat touch screen when texting. Solution: By using the spark energy from human’s fingertip, users would not have to deal with spotting the wrong button. When users move their fingers over the flat touch screen, they could feel and detect where the numeric buttons are without actually pushing on the physical button. B. 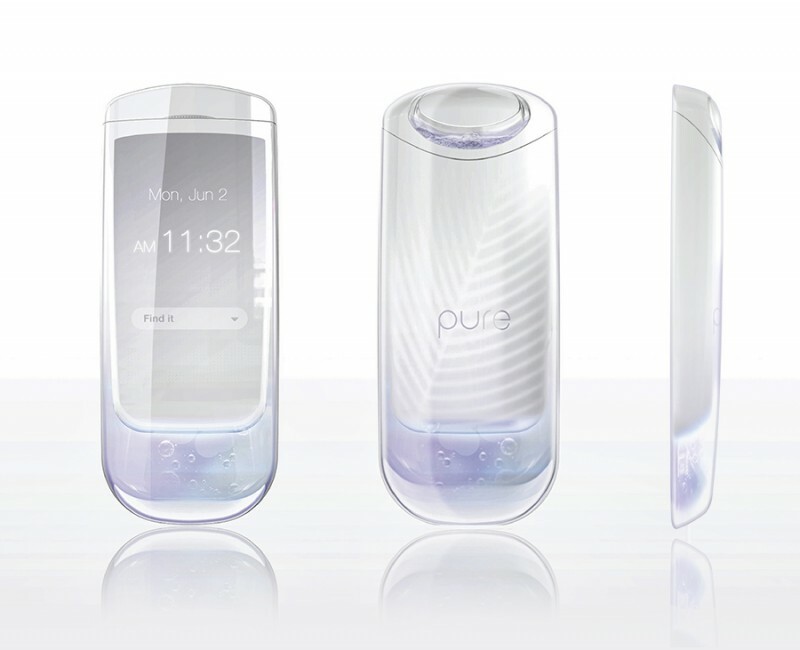 To improve the usability of texting, “Pure Phone” uses all of the front side to write messages. To write the message users no longer have to click or push the buttons. Users could just write the text by using their finger gesture on anywhere of the front side of the phone.